Using event times to create index names is deprecated in this release of Kibana. Support for this functionality will be removed entirely in the next major Kibana release. 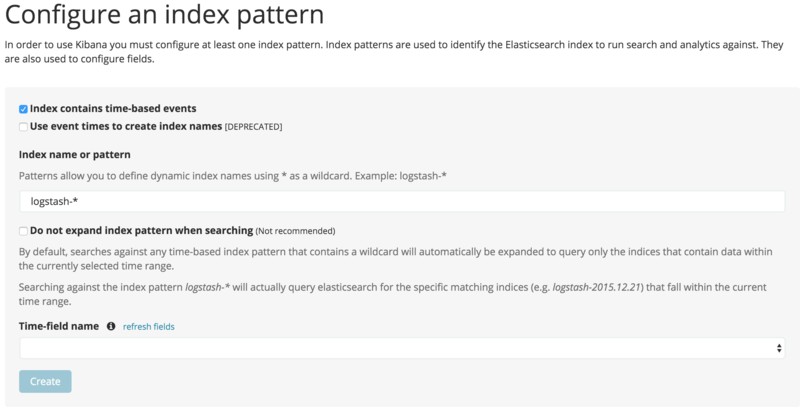 Elasticsearch 2.1 includes sophisticated date parsing APIs that Kibana uses to determine date information, removing the need to specify dates in the index pattern name. Click Create to add the index pattern. This first pattern is automatically configured as the default. When you have more than one index pattern, you can designate which one to use as the default by clicking on the star icon above the index pattern title from Management > Index Patterns.